The Jungheinrich EMC B10 electric pedestrian stacker combines productivity, user-friendly controls and safety for the operator. Support Arm Stacker with straddle arms to enable lifting of bottom boarded pallets. All lifting and lowering functions are conveniently controlled from the multifunctional tiller arm. This allows the operator to concentrate fully on stacking and retrieving. 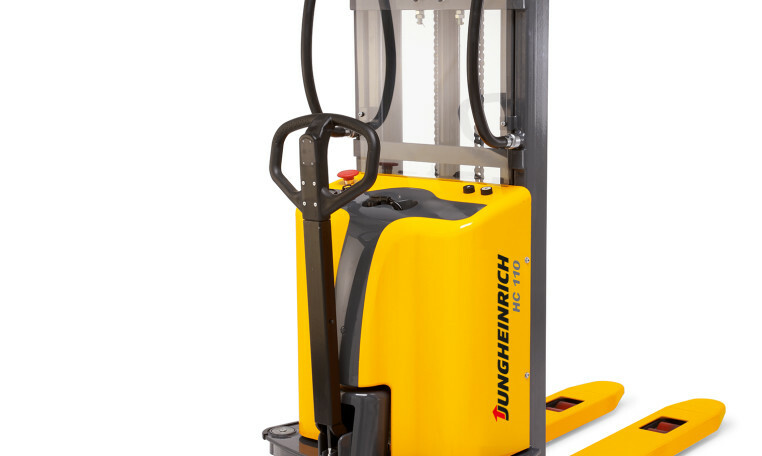 The Jungheinrich EMC B10 is an especially compact pedestrian stacker. The extremely short chassis length and low vehicle weight allows use in extremely confined spaces, in the lift and on mezzanines. The EMC B10 is also equipped with a crawl speed button. A press of the button is all that‘s needed for the EMC B10 to manoeuvre safely, even with the tiller up right. Colour coding for intuitive operation and buttons with wear-resistant icons, grip angle to suit the hand position of the operator, rocker switch for consistent operation in all tiller positions, horn button positioned in the centre of the tiller for ease of access. Service-friendly components ensure lower maintenance costs in the long-term with a maintenance-free 3 phase drive motor. The battery, when used together with the energy-saving 3 Phase system, gives long operating times. Maintenance-free 24 V / 70 ah batteries (gel fleece). Integrated 230 V charger for easy charging at any 13 Amp mains socket.